Fantasyland Construction in the Magic Kingdom is well under way. An impressive number of new features and attractions are being added in the largest Fantasyland expansion ever. One of the featured attractions being added to Fantasyland is Beast's ( From Beauty & The Beast)Castle. Within the castle are 3 dining rooms which make up the Be Our Guest Restaurant. During the current construction Disney World has posted this large mural (pictured above) to show some of what is to come. 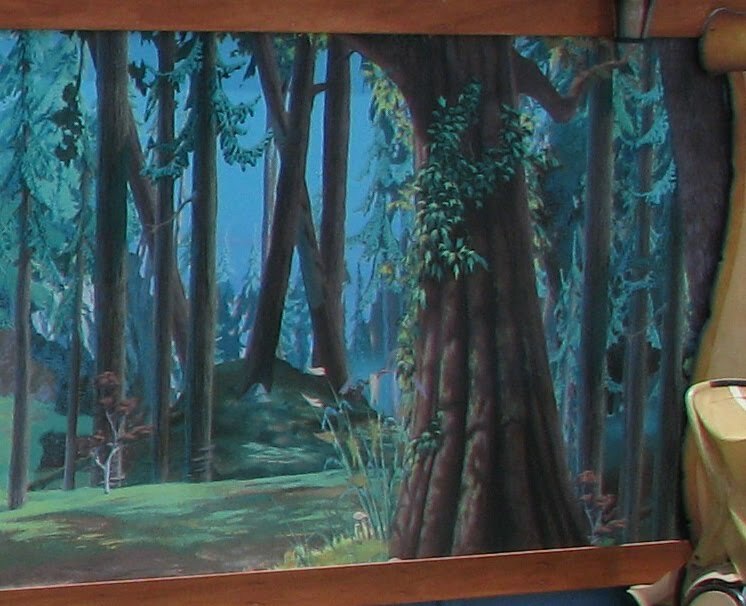 What you see here is Beast's Castle in a forest scene. We split the large mural from above into 3 smaller pictures to allow you to get a better look at what is to come. In the mural Beast's castle resides in a heavily forested area. 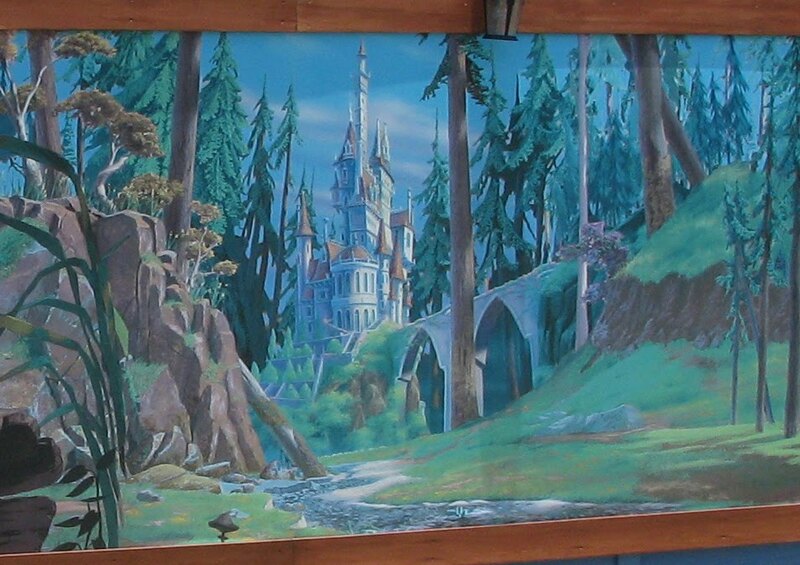 In the area near Beast’s Castle Disney also plans to build Belle’s Village and Gaston’s Tavern. It will be interesting to see how the finished product looks. Perhaps of greater interest than just the castle itself is what will reside within. 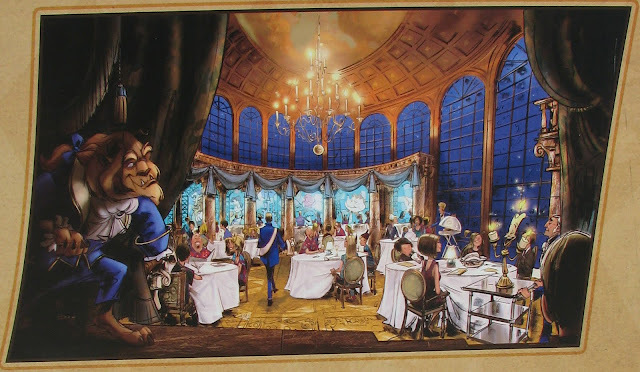 Currently the Be Our Guest Restaurant is planned. Hello! Oh my Goodness! Chip! We have Guests! Welcome! Come in, come in! Make yourselves at home! We've been waiting for so long for someone to serve. It's our job you know. It's our delight! Sit down: pull up a chair. What will you have? A spot of tea? A tasty treat? A banquet fit for a king or queen? Knives, forks, spoons, plates, and glasses! We have guests! Wash, shine, polish, dust! Pots and pans, oven, stove, and pantry! Let's get busy! Oh, how wonderful! Sakes alive! This will be a meal you will never forget! The dining room scene on the poster above is enlarged so that you can make out some of the wonderful details. There are supposed to be 3 dining rooms in Beast's Castle when it is completed. There are also rumored mentions of many possible features that will make this restaurant very intereresting to check out. This 552 seat dining establishment is planned to be a counter service location during lunch hours and transform into a elegant table service dining location for dinner each day. Later this year Disney World will get its first trial of this concept when the Cantina de San Angel/ Hacienda de San Angel open in Epcot with its planned quick service to table service conversion for dinner hours. Rasulo Calls It An "Immersive Experience"
The most interesting rumors have to do with the dining experience itself. Jay Rasulo back in the initial D23 announcement said of the Be Our Guest Restaurant: "It's truly an immersive experience!" If you look closely at the rendering above you see Lumiere on a cart. 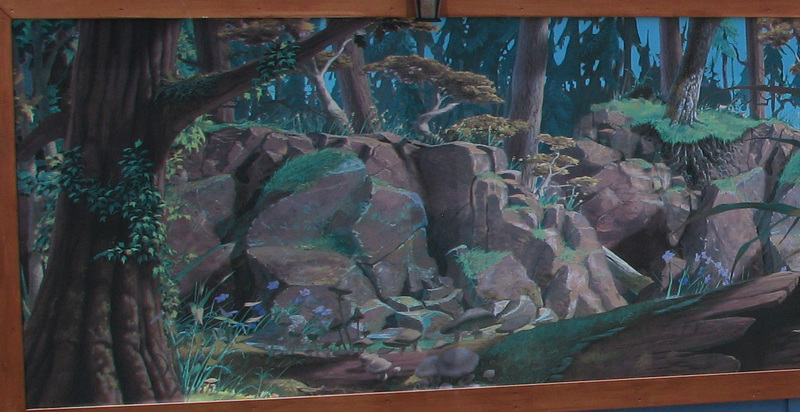 This would be part of Disney's Living Character Initiative where audio-animatronic characters interact with guests. Currently Remy from Ratatoullie appears at Chefs de France in Epcot on a regular basis. Also if you look along the back wall of the Dining Room you can see the multiple screens that have characters from Beauty & The Beast. These could easily be animated and perform for guests. Who knows what other plans Disney has got in mind? Construction will not be complete for Beast's Castle and the Be Our Guest Restaurant until late in 2011 or possibly 2012, so we will have to wait, in a not so patient fashion, until then. As more details continue to come out, Only WDWorld will report them to you. 2 comments to "Magic Kingdom Fantasyland Construction Update - Be Our Guest Restaurant"
Get the cheapest Juicy Couture outlet discounts around. Find it all here: JC handbags, shoes, tracksuits, clothing, juicy couture handbags, and more!